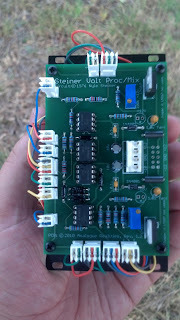 Steiner Synthasystem DIY: Voltage Processor/Mixer complete! Wow, has it seriously been 4 months since I last updated this blog?! Things have been a bit of a roller-coaster here, but I'm finally getting back into this project. Today I finished assembling the Voltage Processor/Mixer module. It is a fairly straight-forward build, though with a number of jacks. 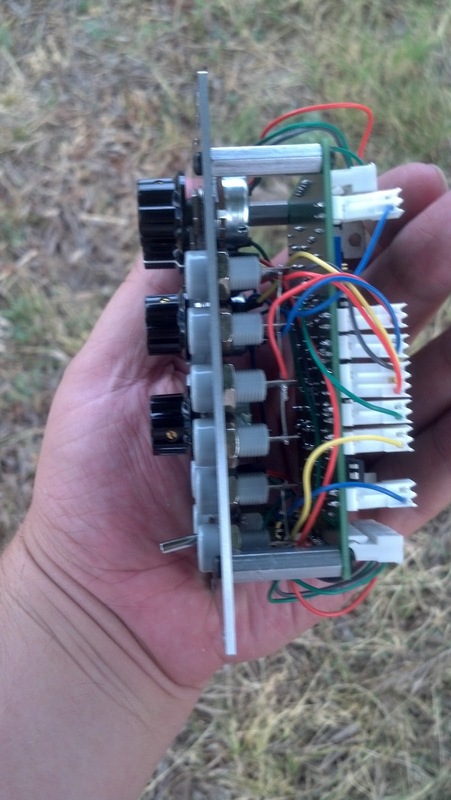 (Nothing nearly as complex as the Selective Inverter, however!) 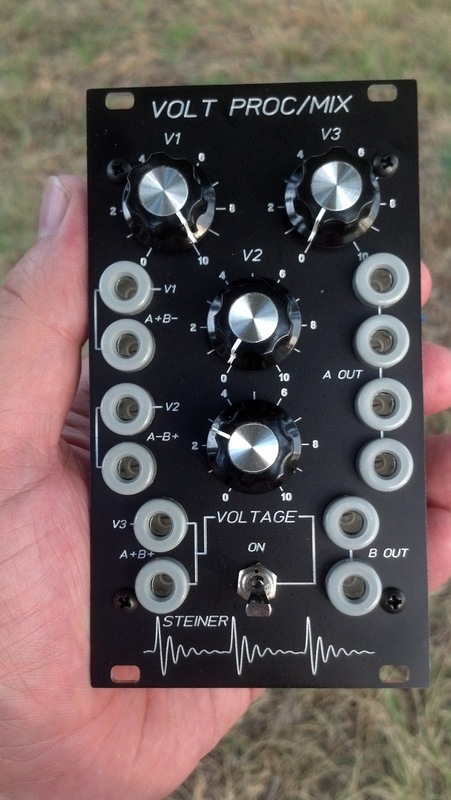 I tested it and everything works great - the attenuated inputs amplify as well, which is a nice plus! 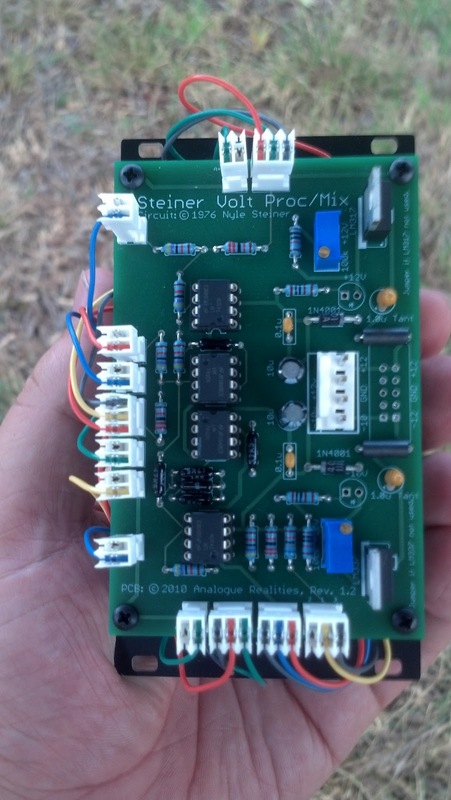 As with the S.I., the offset voltage is bipolar and doesn't center at zero (due to the +12V/-10V supply), so just bear that in mind with testing so that you don't confuse yourself like I initially did with the S.I. (There's a reason why the switch is there!) It should be interesting to play around with this one, with the various inversions and summings. 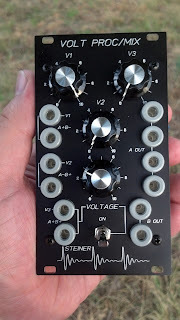 In the meantime, I'm finishing up a few other modules (Noise module with white/pink pot, Input Amplifier, and Tuner/Monitor - just waiting on a few parts), and should have PCBs in soon for some more VCOs, VCAs and VCFs. In addition, I'm also getting everything together to (finally!) get everything together in a cabinet... the small rack I have has just been more of a pain than anything, and I really never got much set up in it!